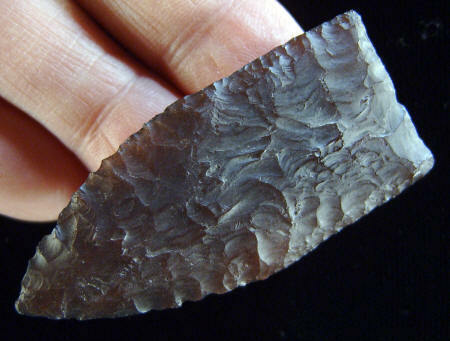 This Goshen point was discovered in the bison bone bed during the excavation of the Mill Iron site. It's atypical in form because it has a base that is almost straight, It has only the slightest indentation. This point is described by Frison & Bradley as being, "in some ways, an extraordinary point." They believe that it was probably made from the mid-section of what would have been the largest point in the assemblage. They also describe it as being flat lens shaped in cross-section. Pressure flaking scars are shallow and difficult to distinguish from one another on one side and slightly more distinct on the other. The edges in the hafting area, on the base and sides, are steeply retouched with pressure flaking and heavily ground. This has the effect of making it almost look stemmed. The material was not identified. It measures 2 3/16 inches (5.5 cm) long. 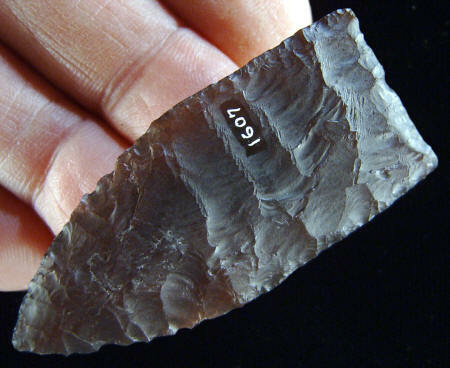 Thirty-one projectile points were found on the Mill Iron site. Eleven were found in the camp area, twelve in the bone bed meat processing area and seven points were found on the surface. These points exhibit a fairly wide range of style and flaking technique. Some of the bases are almost straight, like this example, while others vary from slightly to fairly deeply concave. Also, some of the basal edges are concave but they are straight at the base of the concavity, similar to some Folsom points. The sides are straight to slightly convex and one example appears to be slightly fish-tailed.